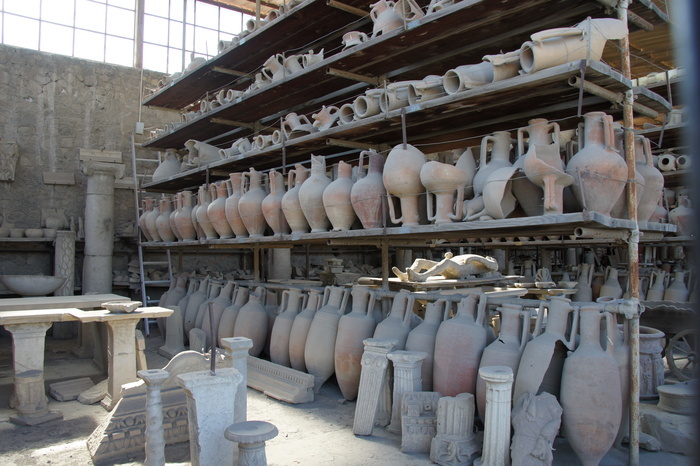 The Forum granary houses many shelves, each full of many artifacts. 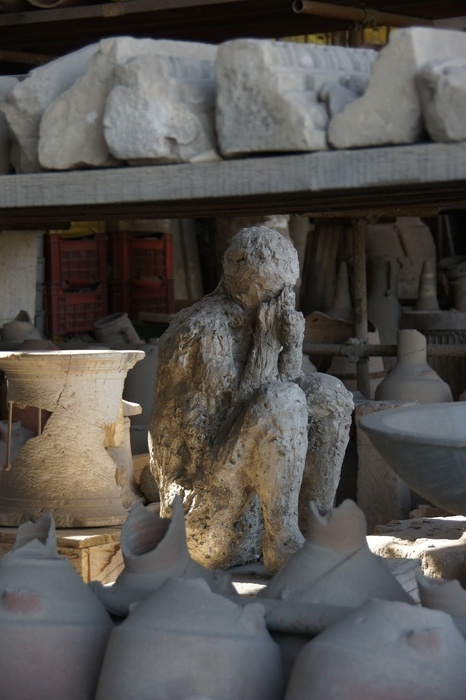 Mostly there are pottery jars, but this is also where they store plaster casts of the spaces left by bodies killed in the eruption. This man was breathing through his cloak to try to clear the air. Unfortunately the volcanic air was full of toxic gasses as well as ash, so this was not enough to let him survive. Secrets of Roman architecture revealed! They actually used legos. Very, very large legos. Many arches in ancient Rome are triumphal arches, celebrating the military achievement of a triumph, a title typically granted to a general after winning a foreign war. 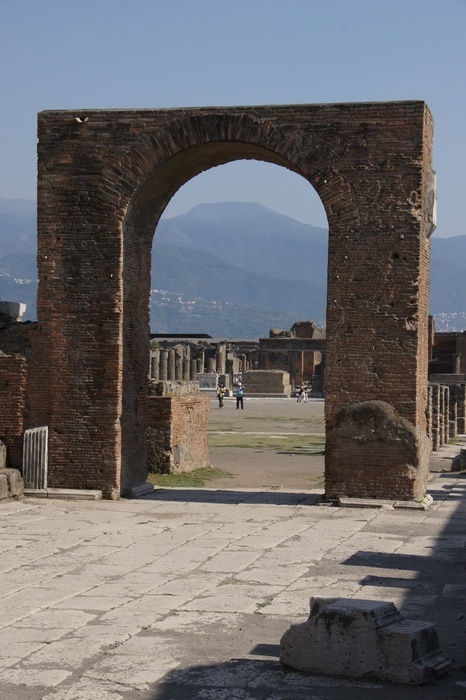 However, all of the arches on the forum of Pompeii are honorific arches - not commemorating a triumph. This one is the Arch of Augustus, commemorating Rome's first emporer, who died just 60 years before Vesuvius buried Pompeii. 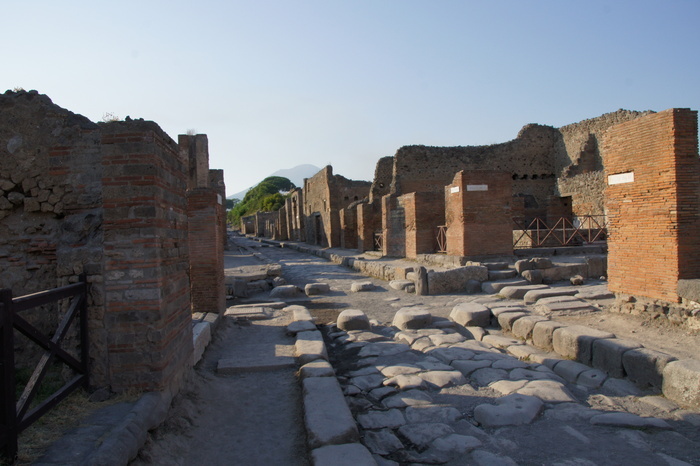 Pompeii had at least four bath complexes. 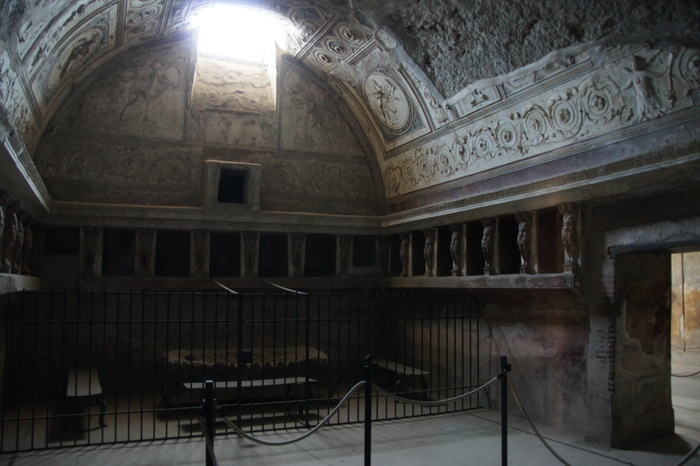 The tepidarium of the Forum Baths would have been the first room a bather entered after the dressing room. The purpose of the niches in this room is not known, but they might have held scented oils or other bathing accessories. As the name implies, the room was kept warm but not hot. 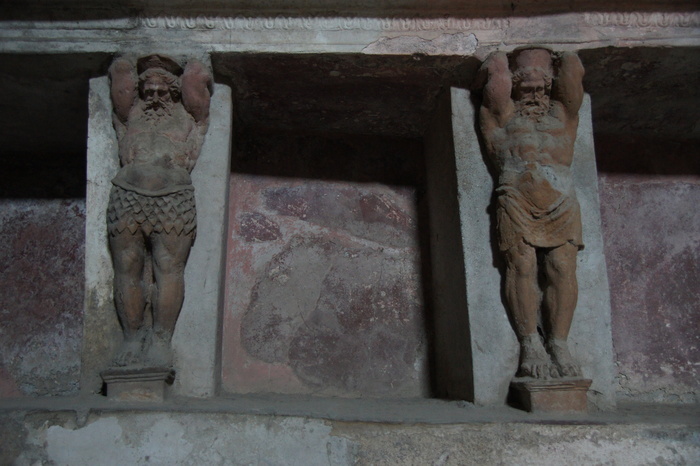 Clay atlantes (figures of Atlas) demarcate the sides of the niches. A large marble basin in the Forum baths. 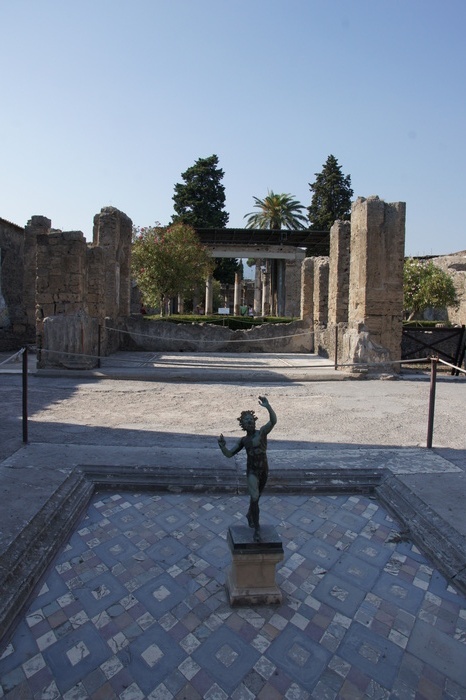 It was donated by a member of Pompeii's city council, but its purpose is not mentioned. It is not very deep, so presumably it was for washing up rather than sitting in. 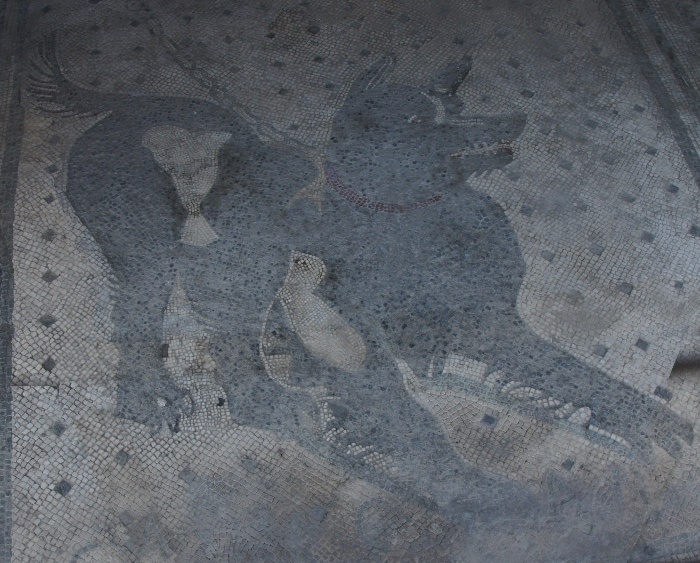 One of Pompeii's best-known mosaics. There's an inscription at the bottom which reads cave canem (Latin for beware of the dog ), but it was covered in dust when we visited. The mosaic is inlaid in the entrance of the House of the Tragic Poet, named for a fresco which actually depicts Ademetus at the oracle (where the oracle said that he would die unless someone offered themselves to die in his place) but which the excavators, in 1824, thought was a scene of a poet reading to a small crowd. 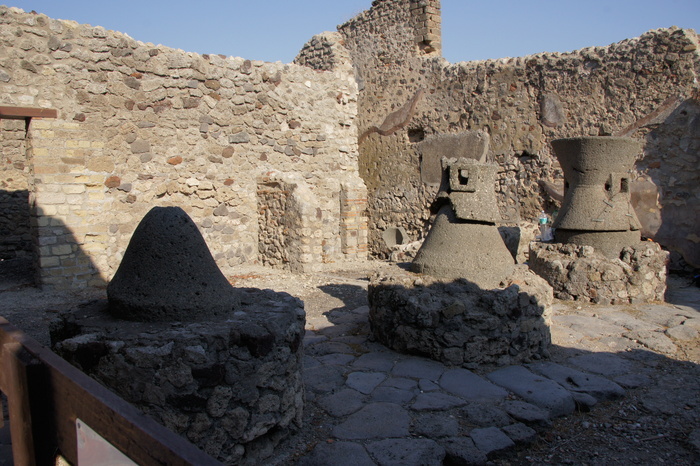 A Pompeiian pistrinum, or bakery. The hourglass-shaped structures were flour mills, usually powered by oxen. Bread was baked daily and sold either at an adjoining shop or by traveling vendors. 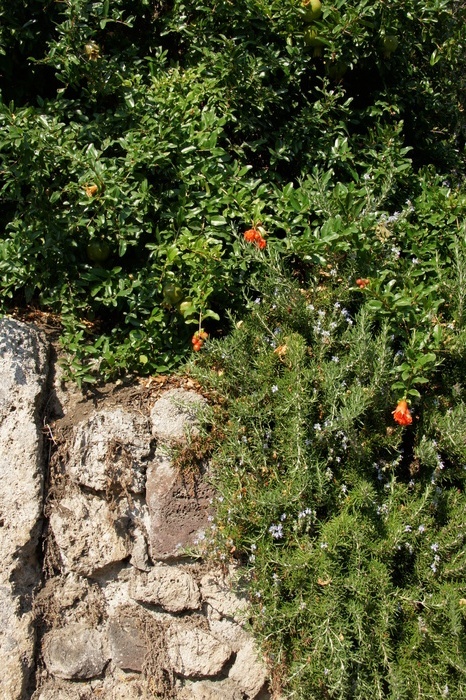 Rosemary and pomegranite plants growing on the edge of town. The road along the northern edge of the city. 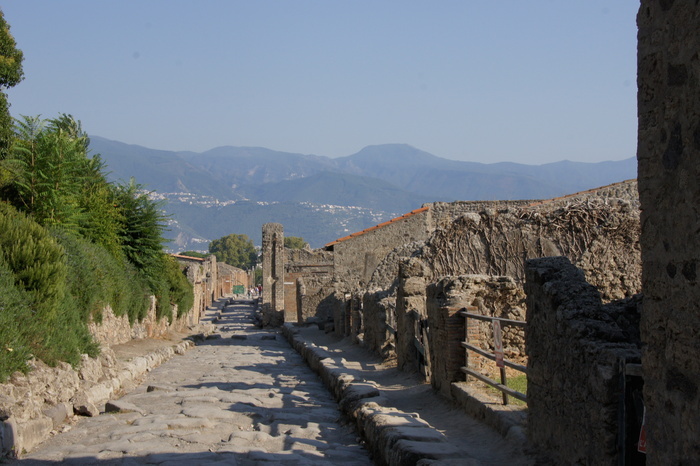 Looking back through the city on the way out - I believe on the Via Stabiana, although it could've been one of the smaller roads nearby. 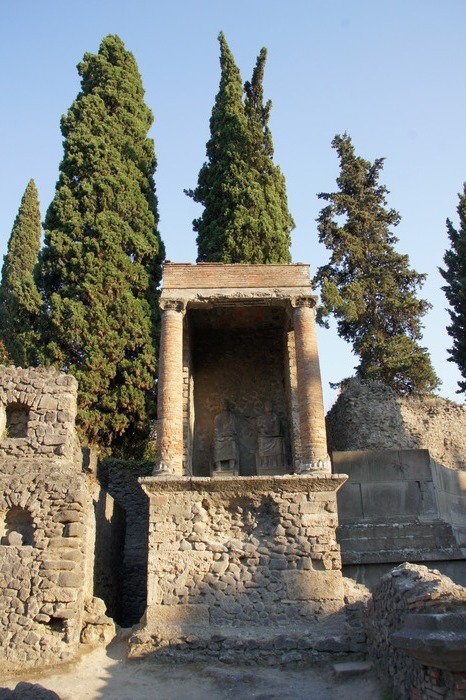 The southern edge of Pompeii is the necropolis - the city of the dead. 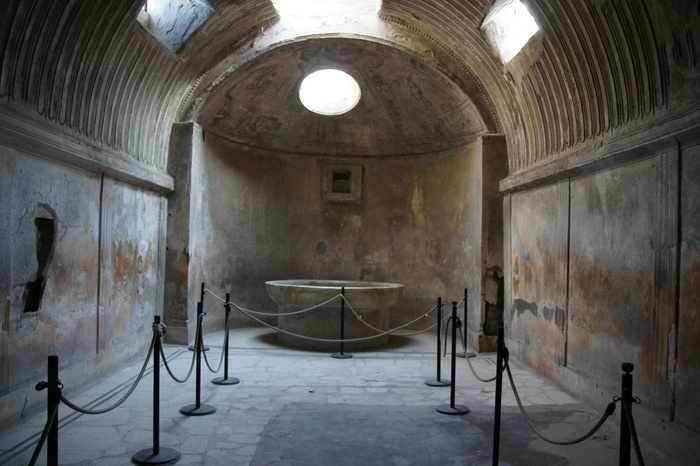 Although at the time Pompeii was destroyed cremation was the norm, in previous centuries the dead had been buried. Burial inside city walls was forbidden, so there were often graveyards just outside of the cities. Wealthy families had mausoleums in areas like this. After about 200AD, burial again became common, including richly decorated sarcophogi. 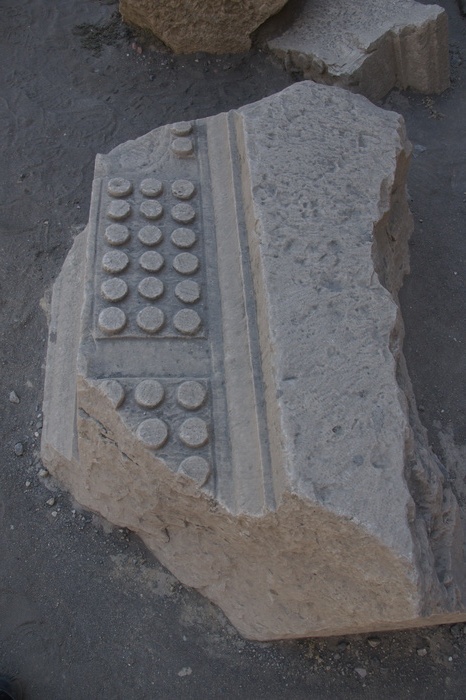 Another structure in the necropolis. 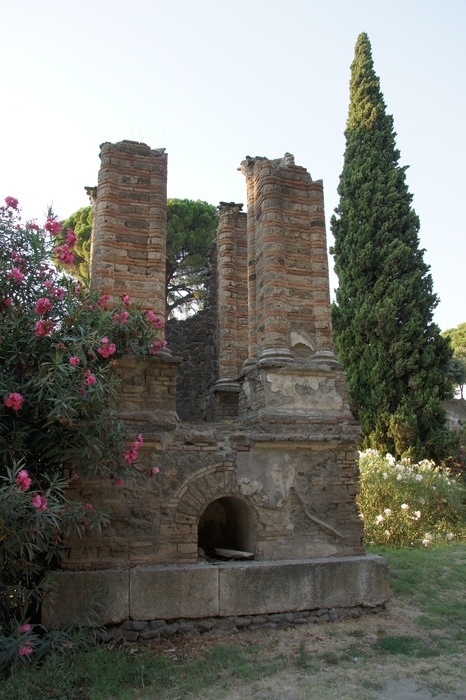 I'm not sure what this one was - a mausoleum or just the ruined remains of an elaborate funerary monument.